Recent advancements in synthetic methods have provided access to the novel functional blocks, nanoparticles. However, in order to build devices and materials from these blocks, new approaches to create designed, static and reconfigurable, architectures are required. Self-assembly is a powerful approach for creating of 3D materials, orchestrating a parallel fabrication from billions of components, and integrating diverse material blocks. Yet, forming targeted organizations via self-assembly remains challenging. Our research program develops broadly applicable strategies to control the self-assembly of the nano-blocks into designed systems and reveals the governing effects. We are using programmable bonds between nano-blocks, fields and stimuli to guide the assembly of material and to control their transformation. For example, for nanoparticles, we use DNA as smart assembly guides and reconfigurable structural elements to form complex nano-architectures and transform them. We apply the developed self-assembly methods to fabricate targeted materials for optical, energy related, and bio-sensing applications. Oleg Gang is a Professor of Applied Physics and Materials Science, and of Chemical Engineering. He earned MS and Ph.D. (2000) from Bar-Ilan University, Israel, specializing in atomic spectroscopy and soft matter, respectively. As a postdoctoral fellow at Harvard University (School of Engineering and Applied Sciences), he studied nanoscale liquid phenomena. Dr. Gang started at Brookhaven National Laboratory in 2002, rising through the ranks to lead the Soft and Bio-Nanomaterials group at the Center for Functional Nanomaterials from 2008. As of 2016, Dr. 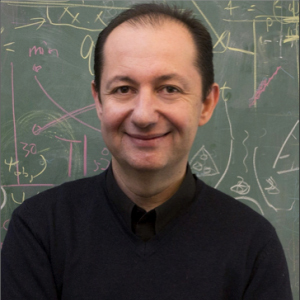 Gang has joined as a Full Professor the Department of Chemical Engineering and the Department of Applied Physics and Applied Mathematics of Columbia University. Dr. Gang has received the University President Award and Wolf Foundation scholarship for his PhD work, Distinguished Rothschild (2000) and Goldhaber (2002) fellowships, Department of Energy Outstanding Mentor Award (2009), Gordon Battelle Prize for Scientific Discovery (2010) among others. Dr. Gang has been named Battelle Inventor of the Year (2016), and is a Fellow of the American Physical Society. 5. D. Sun, Y. Tian, Y. Zhang, Z. Xu, M.Y. Sfeir, M. Cotlet, and O. Gang, “Light-Harvesting Nanoparticle Core-Shell Clusters with Controllable Optical Output,” ACS Nano 9(6), 5657-5665 (2015). 8. T. Vo, V. Venkatasubramanian, S. Kumar, B. Srinivasan, S. Pal, Y. Zhang, O. Gang, “Stoichiometric control of DNA-grafted colloid self-assembly”, PNAS,112, 4982-4987, (2015). 9. S. Srivastava, D. Nykypanchuk, M. Fukuto, and O. Gang, “Tunable Nanoparticle Arrays at Charged Interfaces” ACS Nano 8(10), 9857-9866 (2014).